Gardening and Planting, Just call me Martha Stewart Jr.
New planter--Lets all keep our fingers crossed it doesn't come crashing down out of the ceiling! 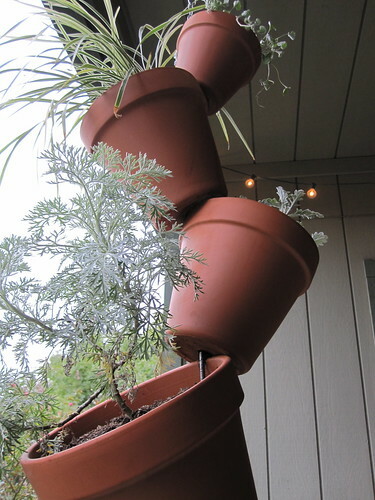 How great is this planter!? A gift from my mother, I got this planter about two weeks ago and I have been obsessed with it for even longer! Some friends of ours have a neighbor that has a planter very similar to this one that I have had my eye on since we met them in February. I have been so intrigued by it and thought it the most clever way to display their plants! Mom and I spotted one in Ellis Pottery when we were shopping for Texas mums and I had to take it home with me. They have the hanging variety (which was my choice) and they also make a stand that sits on the ground and essentially does the same thing. I’m not going to lie to you. I am a little scared that this first go around might have a disastrous fate as it’s heavy as lead and even though the hook it’s hanging on appears to be holding the weight just fine, I am a little apprehensious. Mr. Fancy Pants and I had quite the adventure on Sunday afternoon. We discovered some great places in Austin that we’d never been before! That’s one of the things that I have grown to love about Austin, or big cities I guess, is how you can live here for years and never see it all. I feel like there is always a new leaf to uncover if I feel the need for an adventure. I am currently taking my ‘green thumb’ out for a test run. I have always been convinced that I was bound to kill anything that was supposed to grow in a pot or in the ground. Mainly because I would just forget about it eventually and the poor weed would die a slow and, what I imagine would be, painful death. I can just hear them now–three weeks of silently crying out, in a very horse and scratchy voice of course, for water and what do I do? Let it die.